The first OECD report after Latvia joined this orgainisation (in mid-2016) appeared already in the fall of 2017. That was a profound analysis of Latvian socio-economic problems with very valuable recommendations for perspective growth and progress in Latvian development. See more in our magazine’s publication – “OECD’s economic survey for Latvia: better policies for better lives” (04.10.2017). In: http://www.baltic-course.com/eng/analytics/?doc=133804&ins_print. Generally, the OECD’s main “products” represent officially published and distributed economic reports (global, regional or national in orientation), statistical databases, analyses and forecasts on the outlook for economic growth in the OECD’s member states and around the world. A group of skillful experts provide analyses and make reports on national social-economic growth with additional policy’s recommendations. This time the OECD report*) was devoted to the Latvian business regulation and administration. Acknowledging progress in Latvian legal sector (often referring to “justice sector”, which is not the same) by implementing socio-economic reforms, authors underlined that reforms “provided more business-friendly administration in the country”. Authors call the process “effective access to justice” adding in the introduction that this “phenomena” has been regarded world-wide as an important condition for growth, investment and tackling inequality. Perfect observation, though the authors mix up justice, rule of law and business regulation, as part of the legal sector; some notes on this follow below. 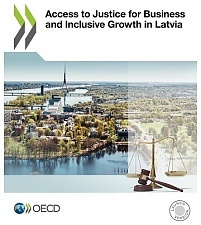 *) OECD (2018), Access to Justice for Business and Inclusive Growth in Latvia, OECD Publishing, Paris,- 158 pp. In: https://doi.org/10.1787/9789264303416-en. According to the report, “Latvia is taking an innovative, user-centered approach” in improving national legal and justice services (p.11). In fact, the report is restricted to commercial legislation, while showing administrative regulations with their impact on business activity. In the conclusion, the report provides recommendations for Latvian authorities to modernise business law system towards favoring corporate activity and inclusive growth. The report starts with assessment and recommendations (covering 20 pages out of 158) on various Latvian legal system aspects, including commercial law, formal requirements for doing business, dispute resolution services and administrative reforms needed. First chapter provides an overview (on 10 pages) of the country’s legal system and governance covering corporate access to justice as well as businesses’ “legal needs” (pp.28-29)., while describing “balancing user perspectives with public needs” (?!). Corresponding recommendations include: legislative amendments to include modern forms of business. In this regard, there are as well two suggestions on “doing business in the age of technology”, including “integrative approach”, reducing formalities and electronic solutions (p.13). Second chapter –“responding to business needs” (pp. 33-58) – makes specific attention to Latvian commercial law and administrative simplification; there is only one suggestion here is reducing frequent changes in legislation. Chapter three seeks to combine administrative and commercial issues in business operation with a view of making business more efficient. In “shaping business friendly governance”, there are three recommendations: a) “integrative access to justice” (! ); b) business policy coordination, and c) advising business before sanctions (consult-first-approach). The report shows that among main obstacles to business activities are: tax rates and tax legislation, frequent changes in laws and “competing with the shadow economy” (p.41). Finally, chapter four is about measuring administrative costs in corporate activities (pp. 130-141). Here the recommendation is to apply qualitative assessments (so-called Standard Cost Model) to measure administrative burdens. Besides, provision of e-services is necessary to streamline administrative procedures (p. 15). The report underlines that administrative costs for an individual merchant amount to € 369 and takes 4,6 days to complete registration; in 2016 the costs were € 222,5 (p. 131). There are in total 20 recommendations in the report (pp.17-19); some final ones are connected to “access to a sound court system”, emphasizing “specialized court proceedings” and more active introduction of alternative dispute resolution (p.16). In the category “ease of doing business”, Latvian entrepreneurs seem quite good among the states around the Baltic Sea area: leaders are Denmark and Sweden (with scores of 3 and 10 correspondingly), Estonia -12, Finland -13, Lithuania -16 and Latvia -19. Even Germany is with 20 point, Poland –with 27 and Russia with 35. Quite notable that in “doing business” the WB group this time concentrated on the following important issues: Starting a Business (transparency of information at business registries), Dealing with Construction Permits (Private sector participation in construction regulation), Registering Property (Using information to curb corruption) and Resolving Insolvency (The challenges of successfully implementing insolvency reforms). Both for the readers of our magazine and –probably- for the national authorities, some additional comments are necessary. - First of all, justice and business have been for centuries almost contradictory issues: suffice it to say that in the British English business (synonym to undertaking) is an activity “with a view to profit”. The ways the profit is acquired is up to the business law “to decide”. Without such legal restrictions businesses would destroy all socio-economic fabric. - Second, only recently developed economies started to include in business culture corporate social responsibility’s (CSR) principles, which are still a voluntary connotation. Still, it is government regulations, i.e. legal rules that are “governing” corporate activities, from starting a company to bankruptcy. It has been so for centuries: business laws have been always “sticks & carrots” for corporate activities. For example, on his painting “Justitia” by Maarten van Heemskerk (1556), “Justitia” carries some symbolic items: a sword, scales and a blindfold. According to the utilitarian theory, justice requires the “maximization” and distribution of the total/national welfare (i.e., in simple terms, by the GDP’s size) across all individuals/residents in a country. Justice is the concept of some cardinal virtues, of which the national legal system and the EU values are the integral parts. However, it is the national legal system (or simply “law & order”) that raises important and complex issues concerning equality, fairness, and justice. Although, “all are equal before the law”, the belief in equality before the law (called legal egalitarianism) hides dramatic inequality, which is clearly seen in the Latvian social realities. In theory, “legal equality” remains blind to social inequality: the same law applies to all who might have disproportional wishes and desires (with harmful effects on the least fortunate). Classical liberalism and modern “regulated liberalism” advocate civil liberties under the rule of law with an emphasis on economic freedom. Equality before the law is one of the basic principles of “modern capitalism”, with a lot of state-regulation efforts, turning it into the “managed capitalism”. - Third, institutional aspects: administrative systems are required to “instantiate ideals of justice”. These institutions may be justified by their approximate instantiation of justice, or they may be deeply unjust when compared with ideal standards. Justice is an ideal the world fails to live up to, sometimes due to deliberate opposition to justice despite understanding, which could be disastrous. The question of “institutional justice” raises other important issues, such as legitimacy, procedure, codification and interpretation, etc. - Forth, “the rule of law” is the "authority and influence of law in society, especially when viewed as a constraint on individual and institutional behavior; (hence) the principle whereby all members of a society (including those in government) are considered equally subject to publicly disclosed legal codes and processes". It is important to underline that the “rule of law”, generally, refers to an optimally functioning socio- political system and not to any specific legal rule. The rule of law implies that every person is subject to the law, including people who are lawmakers, law enforcement officials, and judges. In this sense, it stands in contrast to an autocracy, dictatorship, or oligarchy where the rulers are held above the law. Lack of the rule of law can be found in both democracies and dictatorships, for example because of neglect or ignorance of the law, and the rule of law is more apt to decay if a government has insufficient corrective mechanisms for restoring it. References to: https://en.wikipedia.org/wiki/Rule_of_law. In France and Germany the concepts of rule of law (Etat de droit and Rechtsstaat, respectively) are analogous to the principles of constitutional supremacy and protection of fundamental rights from public authorities (see public law), particularly the legislature. France was one of the early pioneers of the ideas of the rule of law; the German interpretation is more "rigid" but similar to that of France and the United Kingdom. - Fifth, the “rule of law” is especially important as an “influence tool” on the economic development in developing and transitional countries. To date, the term "rule of law" has been used primarily in the English-speaking countries (with a common law system), and it is not yet fully clarified in civil-law countries, which is the case in Latvia. Probably with the advent of Brexit, differences between the common law and civil law systems/countries will not be so vital but being critically important for doing business across the borders and for inherent links between the rule of law and business/economic activities. In the Lithuanian’s analysis, OECD put correctly -dealing with “corporate issues”- attention to such aspects as economic development, business and capital market, corporate ownership and management, as well as state owned enterprises (SOEs). The latter is important both for Latvian and Lithuania; there have been 128 SOEs and 5 listed subsidiaries in Lithuania in 2015: their numbers are reducing: in February 2018 there were “just” 60 SOEs due to mergers. The SOEs sector is the two states often “direct” corporate activity: e.g. in Lithuania they occupy significant market share in energy with electricity & gas (capitalization of over € 2 billion); transport, mainly railways with capitalization of about € 2 billion; industry and forestry (over € 1 billion capitalization), etc. See above mentioned “Corporate governance for Lithuania” report, p. 52. In the conclusion it has to be noted that the OECD report and consequent recommendations are based on Latvian information received in 2014 (?!) with updates from 2017. An online survey among businesses in Latvia was carried out in 2017, with a final update in March 2018. “Effective legal and justice services to citizens and businesses” can foster inclusive growth, postulate report’s authors. Some recommendations are definitely there for all those interested.